Why Play at BlackChip Poker? BlackChip Poker is a reputable brand that’s a great place to play for newcomers and veterans alike. There’s a large welcome bonus, semi-regular reloads, weekly races for cash games and SNGs, and a wealth of other promotions. The tournament schedule is robust, with many different types of tourneys running at various buyin levels, and there are recurring tourney series that entice large fields. Every hand or tournament you play will count towards your progress in the Elite Benefits program, so you’ll still be working your way towards regular rewards even after you’re done with your first-deposit bonus. As a new player, you’ll qualify for a one-time bonus of $1,000. 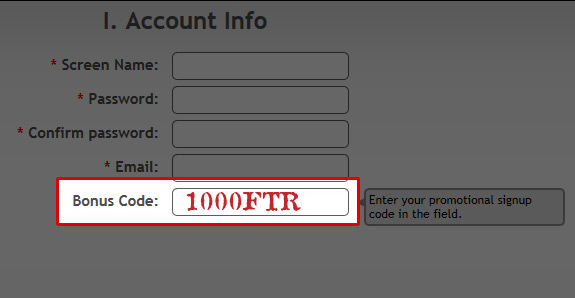 After following our links, you’ll need to use the bonus code 1000FTR when creating your account. Enter it in the form as shown above. This will qualify you for the 100% up to $1,000 Bonus on your first deposit at the poker room. As long as you use the BlackChip Poker bonus code 1000FTR as described above, BlackChip Poker will grant you a 100% bonus on your first deposit up to a maximum of $1,000 in bonus funds completely gratis. Through your normal play at the tables, you’ll earn Award Points (APs) at a rate of 5.5 APs for every dollar in rake contributed or tournament fees paid. Your bonus will clear at a rate of 27.5 APs per dollar of bonus. This works out to a cashback rate of 20% while the bonus is active. Your bonus cash will pile up until you click a button in the software to redeem it. You thus get to choose how frequently you wish to receive your bonus payments. You have 60 days to clear your bonus, so don’t waste any time! For more details on the first-deposit bonus, check out our BlackChip Poker Bonus Review page. As you keep grinding at the BlackChip Poker tables, you’ll receive Benefit Points that will count towards your progress in the Elite Benefits scheme. These points can be exchanged for cash, store merchandise, tournament entries, and other cool items. Be sure to read our review of the BlackChip Poker Elite Benefits program to get all the details of the advantages that will accrue to you from playing regularly at BlackChip Poker. Every week, a portion of the rake collected in ring games (excluding heads-up tables) will be placed into a pool. You’ll earn points between Saturday and Friday depending on how much rake you generate. On Mondays, those who have placed among the leaders in this race will receive cash and satellite entry coupons. SNG players also have their own rake race to participate in. Also running from Saturday through Friday, the Sit & Crush competition awards you points depending on entry fees paid for sit and go tournaments. You get the same amount of points for a given type of event regardless of whether you win or lose. Just as with The Beast, you’ll have the opportunity to receive a cash payout on Monday as well as satellite entries. 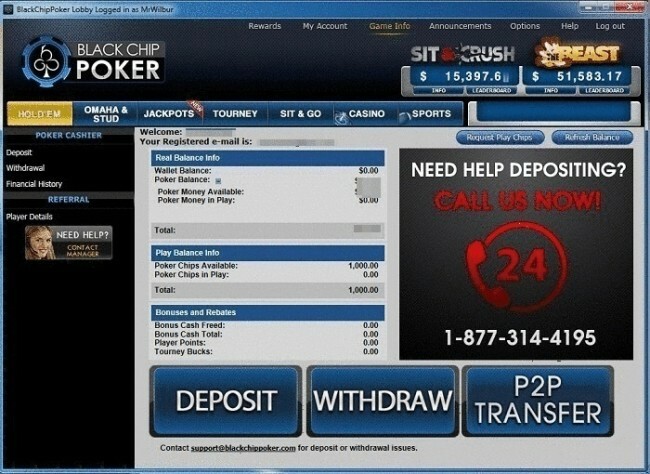 BlackChip Poker opened up shop originally as a skin on the Merge network early in 2009. It quickly distinguished itself among its peers for the quality of its customer support. VIP players could even get extra support through Skype instead of going through the normal email or live chat processes. 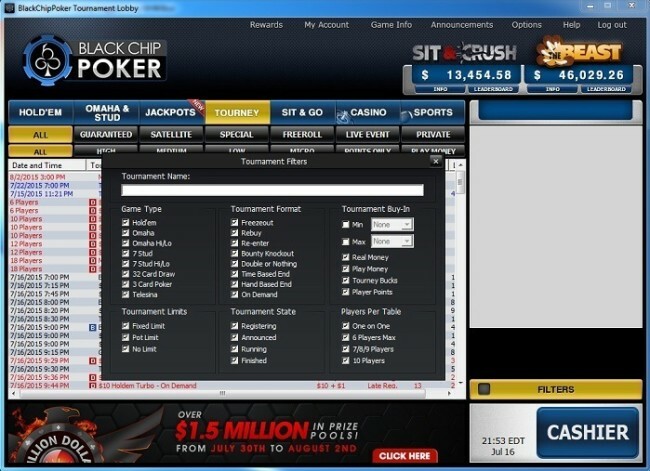 After a while, BlackChip seemed to focus on courting serious, winning players as evidenced by its partnership with the DragtheBar poker training site, which was made available to players who were able to put it a certain minimal level of play every month. 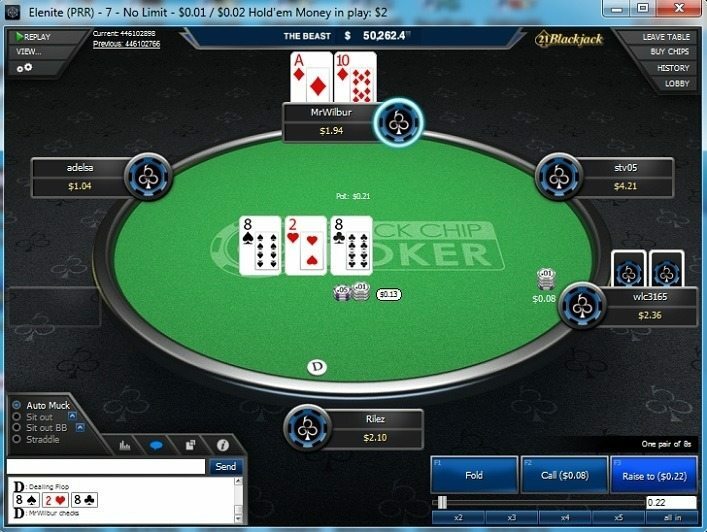 Unfortunately, BlackChip Poker’s focus on dedicated, savvy players may have caused it some problems. The site became involved in rakeback wars wherein different skins on the Merge Network offered under-the-table rakeback deals in an attempt to poach each other’s players. These shady deals caused plummeting margins and an inability for sites to hold onto the players that they had spent their marketing dollars recruiting. With profits plummeting and the management of several skins complaining about the aggressive cross-network player acquisition strategies used by other skins, Merge had to act. Lock Poker, one of the worst offenders in this regard, left the network, and Merge banned any rakeback from being offered at all in January 2013. The network further eliminated player-to-player transfers: a popular way to pay out surreptitious rakeback. It’s unclear if BlackChip was more sinned against than sinning in these shenanigans, but whatever the truth of the matter was, they switched over to the Winning Poker Network in December 2012. 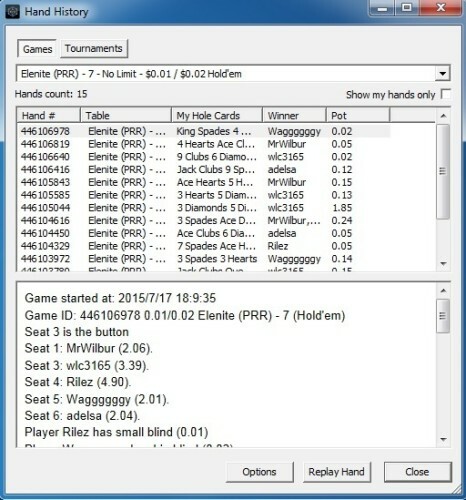 As scheduled, all player accounts were successfully migrated over from the Merge Network to the Winning Poker Network in late 2012. For several years now, BlackChip’s players have been able to take advantage of the regular promotions, speedy cashouts, well-designed VIP program and other benefits available on WPN. The software used at Black Chip is provided by the Winning Poker Network and is a descendent of that used by the now-defunct Dobrosoft Network more than a decade ago. Over time, the poker client has been refined and updated until it now offers a smooth, easy-to-use interface for playing poker. WPN has been slow to adapt to changes in the poker market, and there are no instant-play, Mac download or mobile versions of the software available. Only a Windows download is offered. The BlackChip Poker lobby is divided into sections at the top so that you can easily choose what types of games you’re interested in. For reasons that aren’t entirely clear, clicking on “Tourney” or “Sit & Go” brings up a separate lobby window, which doesn’t really cause any significant harm but is irritating. If you click on “Casino” or “Sports,” a separate window will appear allowing you to gamble on these products. You can click on the column to sort the tables by your preferred criteria, and more sophisticated filtering options are available by clicking on “Filters” toward the bottom-right of the lobby, next to the “Cashier” button. There are different filters available for cash games and tourneys/sit & gos. The tables at Black Chip resize nicely and are well laid out and easy to read. When it’s your turn to act, there are a few bet-size buttons that you can use to size your bet or raise. By clicking towards the top left of the table, on an icon that looks like a gear, you can access the table options. Here you’ll be able to configure a table theme, change your autorebuy and default buyin settings, set your preferred seat, and more. There’s also a “View” menu next to this menu that allows you to adjust the size and positioning of all tables that you have open. While playing at a table, you can click on the previous hand number to access the hand history for it. You can scroll through the list to find the hand you’re interested in. By clicking on “Options” near the bottom of the window, you can change where you want your hand histories to be saved and how long you want to keep them. Click on “Replay Hand” to bring up the selected hand in the graphical replayer. You can play the hand and adjust the playback speed, or go through the action step by step if you’d prefer. 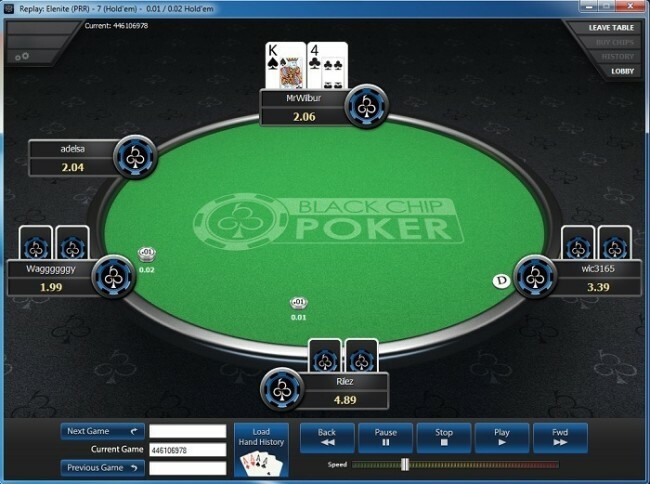 For a more in-depth description of the software used at Black Chip Poker, be sure to take a look at our BlackChip Poker Download and software review. BlackChip Poker is part of the Winning Poker Network, which means that most of its traffic is shared among other sites on the network. Only a few private or promotional tournaments are exclusive to Black Chip. There are usually around 425 ring game players and 550 tourney players online on average throughout the day. The cash game action rises to close to 800 competitors during peak hours. It’s difficult to identify the most popular day at BlackChip Poker, but unusually, there seem to be fewer players at the tables on weekends than on weekdays. Action tends to be greatest around 11 o’clock pm Eastern Time although this varies by a couple of hours in each direction from day to day. No Limit Hold’em cash games run from $.01/$.02 up to $25/$50. There are 9-handed, 6-max and heads-up games at every stake. At microstakes, you’ll have no trouble finding more than a dozen games running at any given time. From $50nl through $2/$4, you might find from 5 to 10 games going. Above this level, the action tends to peter out. There are CAP tables, short buyin tables as regular 100bb buyin games, so choose whichever ones appeal to you the most. Omaha Hi is the next most popular game at BlackChip, and there are usually around 20 tables running at stakes ranging from $.01/$.02 to $3/$6. There are tables going all the way up to $25/$50, just as with Texas Hold’em, but they are only sparsely populated. The active tables are almost always Pot Limit or No Limit Omaha. Fixed limit scarcely runs at all. Omaha Hi/Lo is spread in PL, NL and Fixed formats, and there’s also Limit 7-Card Stud, Limit 7-Card Stud Hi/Lo and Limit Hold’em available. Unfortunately, there are seldom more than a handful of tables going across all of these games combined. Sit-and-gos at Black Chip range from $1.50 + $0.11 events all the way up to $1,200 + $15. There are 2-player, 6-player and 9-player games. SNGs below $25 seem to fire quite regularly, but action above this is small. There’s a special type of SNG called Jackpot Poker on the Winning Poker Network. These are three-handed games that feature a randomly multiplied prize pool. The normal first place prize is twice the buyin, and second and third places receive nothing. However, if you’re fortunate enough to hit a high random multiplier, the prizes could be substantially higher. The largest prize to be won is 2,500 times the buyin, and at the higher multiplier levels, second and third places receive prizes as well. There’s even a deal feature implemented for these large multipliers so that the players can reduce their risk if they so desire. Jackpot Poker is available for buyins of $2, $10 and $40. There are some freerolls at BlackChip, but most tourneys fall into the $1.10 – $109 range. The Sunday “major” event is the $200 + $15 Sunday Special with a $115,000 guaranteed prize pool. There’s also a high-roller event on Sundays that costs $500 + $30 to enter and guarantees $20,000. Most tournaments draw a few hundred entries, but the recurring Online Super Series (OSS) events sometimes gather thousands of participants. Black Chip Poker runs a $500 + $40 Million Dollar Sunday event every few months. This tourney, which guarantees a cool $1 million prize pool, is one of the largest recurring, online poker tournaments. Combining some of the features of both sit and goes as well as multi-table tournaments, On Demand tournaments start when a predetermined number of participants register, much like a SNG. However, once they start, there’s a late registration period allowing others to enter, just as with an MTT. On Demand tourneys are available from $0.55 up to $55, and there are also freerolls in this format. 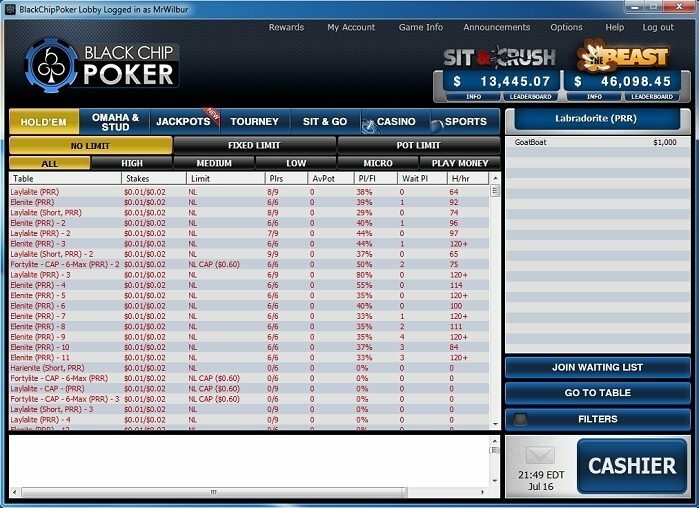 BlackChip POker wants to make it as easy as possible for players to deposit and begin playing right away. They allow you to use Skrill and Neteller, which are probably the most convenient for the majority of players. Other options include Bitcoin, credit card and Western Union. The deposit methods available to you will vary a bit depending on the country you’re playing from. To make a deposit, first click on the blue cashier button near the bottom-right of the poker lobby. This will bring up the cashier. Now click on the big button that says “DEPOSIT” towards the bottom of the cashier. 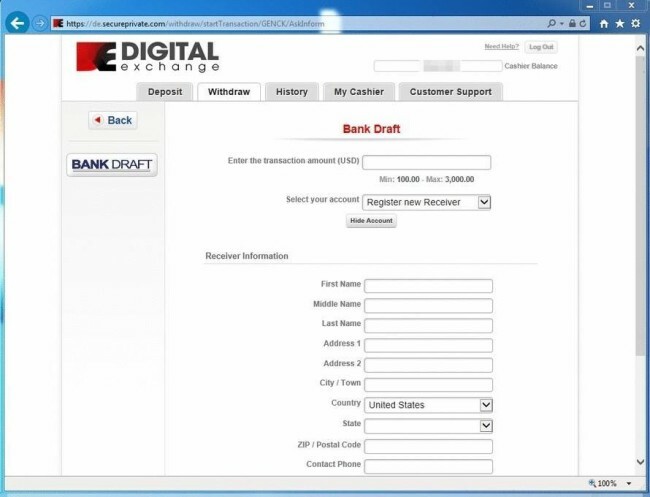 An instance of your web browser will appear with the deposit form visible. You can select the means by which you wish to fund your account on the left side of the page. Fill out the information requested by the form to proceed with your deposit. There’s no need to enter anything in the “Have another promo code?” box on your first deposit; for you will have already entered the 1000FTR code when creating your account. If, however, you receive any reload bonus codes in the future, this is where you will enter them. 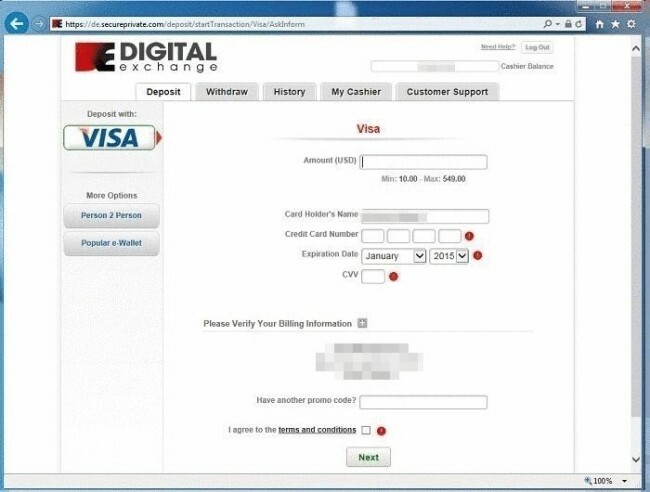 Click the green “Next” button on the bottom of the page to proceed with your transaction, and follow all the instructions on subsequent pages. Now that you have some money in your account, you’ll be able to begin playing immediately. If you’re lucky enough to win a substantial sum of money, then you’ll probably want to cash out at least some of it. 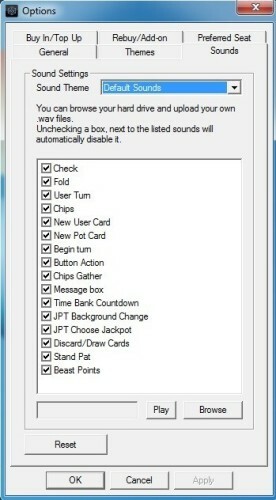 Click on the “Cashier” button within the poker client, and you’ll be presented with the cashier interface. After you select the means by which you wish to receive your funds, you’ll have to fill out a form containing the amount you wish to withdraw, your personal information and other details that are required by your method of payout. Click on the green “Next” button to continue with the withdrawal process. Follow the directions contained on subsequent screens, and you’ll be on your way to having your cash in hand. There may be fees associated with some withdrawals, but you can usually request one cashout for free by check per month. You’ll have to either scan or take photographs of your documents. Then you can submit them by fax to 1-888-902-2541. You’ll have to include your username so that support knows which account the documents pertain to. Alternately, you can send them via email to support@blackchippoker.eu. It’s probably best to take care of this task well before you’re thinking of cashing out so that your withdrawal isn’t subject to any delays. There’s no mobile app or website for BlackChip Poker. The only platform that works is Windows desktop. If you can’t resolve your questions by reading the comprehensive FAQ at BlackChip Poker’s website, then it might be time to contact support personnel. You can get in touch with them 24/7 at 1-877-314-4195. There’s also a live chat feature on the webpage. Or you can submit a webform to send an email. If you’d like to play a full selection of poker games at stakes ranging from micros to nosebleeds, then BlackChip Poker might be right for you. There are speedy cashouts, a large initial bonus, ongoing rake races and plenty of other reasons to make BlackChip your poker home. This poker site is open to players in every county in the world except for Iraq, Iran, Afghanistan, Pakistan, France, Spain, Turkey and Malaysia.